Sure, the Miami Heat had that long layoff after sweeping the Milwaukee Bucks in the first round of the playoffs, and they missed several wide open shots early in the game, and LeBron James picked up his Most Valuable Player award in a ceremony with commissioner David Stern before the game and Chris Bosh was reported missing to the Miami police and there was a big manhunt. OK, not exactly the last part. But the defending NBA champion Heat have plenty of reasons to look at the Bulls Game 1 Eastern Conference semifinals 93-86 victory Monday and say they’ll get ‘em next time. Because the Bulls, now 9-8 against Miami in the last three years, pounded Miami once again on the boards, 46-32. The Bulls dominated in second chance points, 17-8. They had 40 inside points to 32 to the Heat. Yes, Jimmy Butler was terrific in the absence of Luol Deng, playing all 48 minutes for the third consecutive game, the fourth player to do so in the last 35 years. And with an amazing line of 21 points and 14 rebounds, including nine of 10 from the free throw line. Nate Robinson, who according to ESPN stats actually leads all players in the league in fourth quarter playoff scoring, led everyone with 27 points, including 24 in the second half after he took 10 stitches in the lip from a hard fall fighting for a loose ball with James. Joakim Noah battled through foul trouble for 13 points and 11 rebounds, and Taj Gibson was strong off the bench with a dozen points. But perhaps more than anything, the Bulls repeated the formula they’ve employed and which has been the most successful in defeating Miami’s varied game: Pound them on the backboards, close down the lane and force them outside and make them make those jump shots until the basket starts shrinking in a close game. Slow the pace, protect the ball and curtail their dunks and runouts. It doesn’t mean the Bulls will win this series as unlikely as it may seem. But especially with Deng and Kirk Hinrich out with injuries and hopefully returning to the series later this week, it also doesn’t mean the Heat doesn’t have to pay attention. The Bulls got their attention pretty impressively Monday. “I’ve played on some tough teams, but this one is a little different,” said Robinson, who scored seven of the Bulls last 10 points in their 10-0 run to close the game. “There’s something special about this group. For me, it feels like we’ve been playing together 10 years. We love to play for each other, regardless. A couple of times in the game me and Jimmy had miscommunications and he told me on a switch to make sure to go under, little things like that. You make adjustments and you don’t need the coach to tell you. He’s younger than me and is telling me that. He’s helping me out. That’s how it is with each guy on the team. It makes it easier to go out and play, and it’s fun. It was as emotional and passionate as Robinson has been around the Bulls this season, and he did well in expressing the fabric of a team that comes off a dramatic seventh game win Saturday and pulls away in the fourth quarter Monday with the most final quarter points the Heat has surrendered all season. The Heat has been held under 90 points 11 times this season, three by the Bulls. The Heat has won 41 of its last 44 games. Two of the losses have been to the Bulls. This is less coincidence anymore, not so much the long layoff for Miami, though expect James to be much more aggressive scoring to start Game 2 after a career low two first half points. Perhaps the Heat makes more of those first half threes that were mostly open. But the Bulls know something about playing Miami; you can sense the Heat don’t much like the physical play, the lack of Bulls’ regard for their success and reputations, the necessity to put in that extra effort against a guy who doesn’t stop. We know LeBron James will do it, and he had 15 fourth quarter points. But does he have enough acolytes? Though it was hardly a celebratory Bulls team afterward. They are serious. They do believe they can win as shorthanded as they remain. This is what it has come to. Bulls players, an All-Star no less, cheering from hospital beds. Earlier in the day, Butler said he called Deng about how to play James, whom Deng usually defends. This stuff has been pretty impressive with Butler, who played four minutes in last year’s playoffs and was buried on the bench even to start this season. But he’s emerged this season and especially in the playoffs as a starting level player, amazingly tough and seemingly incapable of being tired. After games he looks like he’s taken a long walk. Being the star of the game he had to wait until late to do his post game interviews in the large media room. So he dressed slowly next to Gibson, who generally speaks to reporters first. With no one else talking, all the reporters gathered around Gibson, who played his best game of the playoffs and thwarted Miami’s strategy to play James on Gibson so James could cheat into the lane for weak side blocks. But Gibson was making his shots, leaving James caught and often in poor position. As was Butler trying to dress next to Gibson. Finally, Butler grabbed his cowboy boots, not something you see in NBA locker room too often, though Noah was wearing one of his Rastafarian hats, which you don’t see that many of as well, and departed to a quieter space across the room. No respect, other than from the Heat. Certainly the 29 NBA teams that selected someone ahead of him in the 2011 draft. Or, a lot of them, anyway. Though Bulls coach Tom Thibodeau downplays adjustments he makes. And he does more rely on that notion you play the way you have, though harder and better and tougher, if necessary. Which the Bulls generally do as they don’t vary much from their basic sets and schemes. But Thibodeau made a nice move with Gibson as Carlos Boozer struggled early (six points and seven rebounds in the game) and put Gibson in to spread the floor so James could not cheat inside and help. Miami was more aggressive defensively in the first half, which was 37-37. They are a strong team in blitzing the pick and roll, which was giving Robinson difficulties seeing over the double team. That resulted in turnovers as did pressure on Marquis Teague, which the Nets didn’t do as much. But Thibodeau came back after halftime with a slight adjustment in the angle of the screen so Miami had trouble blitzing and then being able to recover to the roll man. Plus, Thibodeau obviously emphasized ball movement off that first pass, which spread Miami out more. 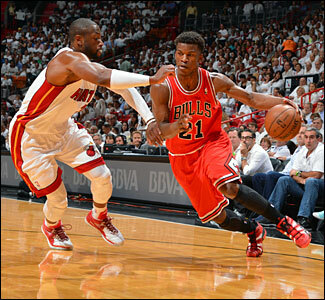 The Bulls had eight assists in the fourth quarter, six by Robinson. Plus, by putting Gibson in the game, the Bulls were able to do more perimeter switching with Gibson trailing Ray Allen, who was just two of seven for nine points in 29 minutes. The taller Gibson gave Allen pause defending his shots, and that is another element that makes the Bulls defense difficult to duplicate. Likewise, Noah also is employed switching on the perimeter, which is a trait few teams can duplicate. Noah also lent an assist to Derrick Rose, even though Rose didn’t ask. But like a lot of his teammates, Noah has been getting tired of the criticism of Rose among some in the media and public and in answering a question about winning without Rose decided he’d heard enough. The Heat certainly couldn’t deal with the Bulls in what had been looking like an easy walk to the Finals. Perhaps they’ll still get there as the only two times this Miami group lost the opening game of a playoff series they swept the next four, including the 2011 conference finals against the Bulls. And it hardly seems like Deng or Hinrich would play in Game 2. But the Bulls remain tone deaf to these concerns and took it to Miami from the start. It was an expectant crowd with the MVP presentation and fans all wearing James masks as he waved the trophy around the arena. A sixth grade girl who is a lucky charm of sorts sang the national anthem and Wade, as he generally does, ran to each quadrant of the arena before the game to wave the white out shirted fans on toward enthusiasm. But the Bulls immediately started pounding Miami inside with Boozer and Noah scoring six of the eight points in an 8-1 start. The Heat get away with their small lineup with Bosh at center, though mostly stepping outside to shoot jump shots, and Udonis Haslem the dirty work guy. But few teams are like the Bulls who can have their center step outside and defend Bosh, who rarely ventured into the paint, and then go at Haslem as Bosh usually will take Boozer. But Haslem is too small for Noah, giving the Bulls a mismatch on the boards. This is not an easy situation to solve for Miami. They play Chris Andersen, but while he is energetic like Noah he isn’t a big rebounder. The Heat used to use Joel Anthony, but he slows their game. So they’ll try Shane Battier when he isn’t flopping like a dead fish. But he’s also too small. That usually forced James inside on the boards, and he did lead Miami in rebounding with eight. But when their three big men combine for 10 that’s a problem. The curiosity about the first half was how much passing on offense James did. He was one of six overall shooting, mostly choosing to draw pressure and pass. That was the old James. The James of this season was the aggressor, not worrying so much about the right play as the big play, the Jordan and Kobe view. James seemed to revert Monday, perhaps rusty from the layoff, though you’d doubt that the way he works out, or mad at someone. In any case, it didn’t work as the Heat shot 33 percent in the first half. The Bulls weren’t much better, which is probably where Miami lost it. The way the Bulls were having trouble even bringing the ball up court at times with Miami trapping in the backcourt was a time the Heat could have taken control of the game. When you don’t and the rely on your three point shooters, that basket can seem smaller. The Bulls led 21-15 after the first quarter, but Noah had two early fouls. As the Heat players were missing shots, James took a few turns deep in the post, which drew help as he passed out for better shots. The Bulls probably will see more of that in Game 2. 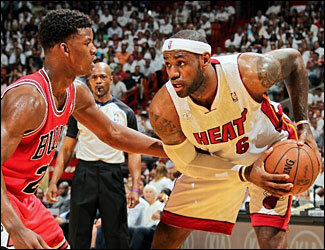 Another reason the Bulls have reasonable success against Miami is they don’t commit full double teams to James. They help, sure, the big men shading toward James. But it’s not a hard double as everyone is required to get back to their man. Again, that requires a rare level of activity not many defenders will do. Miami began to gain some control in the second quarter, though more with the Bulls reserves having trouble getting the ball into the right positions or even into the front court. Daequan Cook was forced out of bounds with the ball twice on traps, and with about four minutes left in the first half Robinson went down hard on his face chasing a loose ball with James. Robinson is a former Division 1 football player and perhaps the toughest guy on the team. But he as gushing blood badly on this one and went immediately to the locker room. Though the Bulls were having some fun with Robinson afterward as you could tell the fat lip was bothering Robinson more than the pain. There went that pretty face. Gibson laughed and said he kept telling Nate to wear a mouth guard, and Robinson admitted he had trouble not laughing in timeouts as teammates kept looking at him and knowing his vanity and laughing. Well, it wasn’t an uptight Bulls team. The Heat would be as well as Robinson came out after halftime pulling up for a three on the way to a 13-point quarter, Noah taking a rebound and galloping full court for a score, Boozer sealing inside on a Noah pass for a dunk and Robinson closing with a three. But the Heat was finding its own range, James a bit more aggressive and taking a 62-58 lead going into the fourth quarter. Ok, the Bulls had their fun. Miami was 33-0 this season leading going into the fourth. Perhaps the Bulls are not that good with statistics. James made a terrific a three point play putting the ball up lefthanded on the run midway through the fourth even as Butler tried to wrap him up. That gave Miami a 73-69 lead with 7:04 left, and then the Heat spread the Bulls out as James drove for another three-point play and 76-69 Miami lead with 6:30 left. Miami doesn’t lose leads like that. Or do they? Robinson broke the run with a drive and two free throws, the Bulls forced Miami into a shot clock violation, Butler took a last second pass from Robinson drove and was fouled and made both. Allen missed an open three as the fans sagged in disappointment. Marco Belinelli, shooting poorly until then and without a three in four attempts, then ran the two guard floppy action and made a three from on top and suddenly the Bulls were back tied at 76. 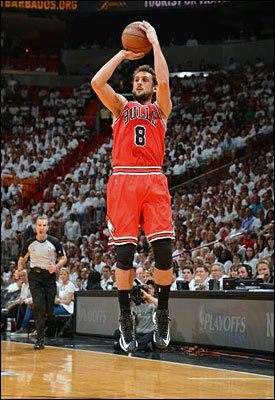 The Heat got a free throw, but with LeBron sagging in to help, Gibson made a 20 footer for a 78-77 Bulls lead. Allen came right back with a three. But then Butler matched that, one pressure shot after the next. Miami retook the lead on a Bosh dunk to make it 85-83 with 2:43 left and James making one of two free throws with 2:22 left. But the Heat would not score again as the big play was another Belinelli three off a Noah offensive rebound, Noah stopping Bosh and then Robinson with a 19 footer, Wade and James both missing long threes while the littlest guy was beating everyone to the basket as the Bulls pulled away. It worked for a heck of an opening win.